Raffle: Susan Klein-Rothschild brought a $44 gift certificate to Cafe Stella and a box of chocolates. GSE reception was fantastic. Thanks to Amy Clemens for organizing it. District Conference was attended by more than 300 people. There were great events, speakers and fellowship. Bill Boyd was really impressed by the quality of the young speakers. Janet Napier was impressed by the food. David Vo and David Velarde honored Tom Heath as new member Maurice Moreno‘s sponsor. Grant management training seminars are next week: Oct. 13 in Bakersfield; Oct. 27 in Oxnard, Nov. 3 in San Luis Obispo. Fiddlers’ Festival: We need more volunteers! We need each member to sell their tickets, get sponsors, ad buyers, get raffle and auction items. Mark Rheinhart‘s approach: Consider approaching it as employee thank you or as business development — invite clients. New this year: Sent letters to past members. Give checks to Darren Doi. Goleta Lemon Festival is same weekend as Fiddlers’. Susan Klein-Rothschild, DG Frank Ortiz and David Velarde presented the El Puente Student of the Month to Anthony Vasquez. He was joined by his teacher Eddie Torres and his mother Nancy Vasquez. Rotary lunch lottery: No reports. Board will meet following the meeting. It’s national pickled peppers month. Yesterday was national name your car day. Today is virus appreciation day and national caramel day. Tomorrow is national golf day, national taco day and national vodka day. 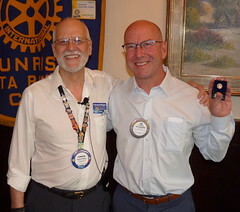 Program: Bill Boyd, assistant governor for group 8, introduced District Governor Frank Ortiz, a member of the Rotary Club of Santa Maria Breakfast. 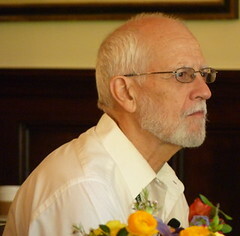 During his presidential year, his club won best medium club for the district. He’s attended 6 RI conventions. He participated in a National Immunization Day in Nigeria. He was formerly the Santa Maria City fire chief. He made a $20 donation so that he can make a personal revelation: He’s a San Francisco Giants fan. He’s here to acknowledge this club’s accomplishments. David Velarde is a passionate leader. Don’t forget the less fortunate. Do good things publicly so people know about Rotary. Scottie Ortiz joined Frank at the polio NID. She’s a CASA — court appointed special advocate. She told a story from a kid’s perspective. Membership: How do we keep all 63 active members active at the end of the year? Be relevant to the community, do a good job, share what you do. Consider supporting Rotaract more. March 6, 2013 will mark 28 years. Charter members: Fred, Steve M, Brooke, E. Russell Smith… Thank you for your service. Ignite: Retain and expand membership. Dr. Otto Austel inspired him to participate in the polio National Immunization Day in Nigeria. A newborn who wasimmunized on their trip was named after Scottie. We’re a generous club — almost to $400,000 to The Rotary Foundation. They hosted an Argentinian Rotary Youth Exchange student. She arrived without speaking any English. They recently attended her wedding in Argentina. More recognition: He gave E. Russell Smith a visionary pin for sponsoring David Velarde. 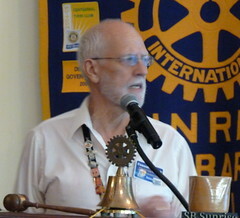 In summary: Do relevant projects; grow membership; support TRF; develop leadership.